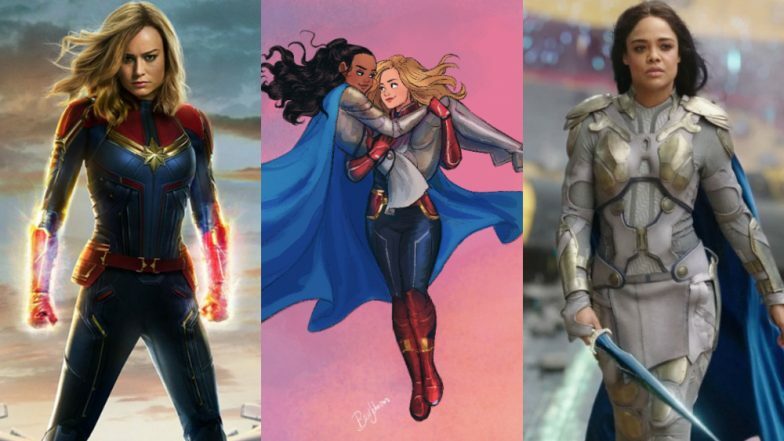 Fans are conspiring to make Captain Marvel fabulous and gay. In case you are late to the party, before fans shipped Carol Danvers and Mighty Thor, many were rooting for her to have a gay storyline. Some even said that the latest Marvel movie, Captain Marvel, oozed major gay vibes. In fact, for some reason 'Brie Larson gay' was trending on Twitter, earlier in the day. Cashing in on the same sentiment, Brie Larson has given the LGBT+ community one more reason to be happy and gay. The actress took to her Twitter page and shared a homo-romantic sketch in which Captain Marvel features with Valkyrie. Let us go through the series of events (almost) chronologically. First of all, let us look at the tweets that thought Carol totally had a thing with her BFF Marie in Captain Marvel. Then, Brie Larson shared the trailer of Avengers: Endgame. The internet went back to its heterosexual propensity and shipped Thor with Carol. But then, Brie shared the trailer on her Instagram and openly bisexual actress, Terresa Thompson, who plays Valkyrie in the MCU, commented on the post, "hot". Thus giving gay Twitter an entirely new couple to ship for. The internet got what it wanted. Het marvel fans: did you see thor?!?! He's in love with carol!!!!! So, there is that. Stakes are high now. Let us see if Marvel actually gives the people what they really really want. A lesbian love story between Captain Marvel and Valkyrie.